The JSC Small Business Council's goal is to host at least one networking event annually for small businesses to learn the latest information from NASA and other industry partners, as well as, U.S. Small Business Administration representatives. 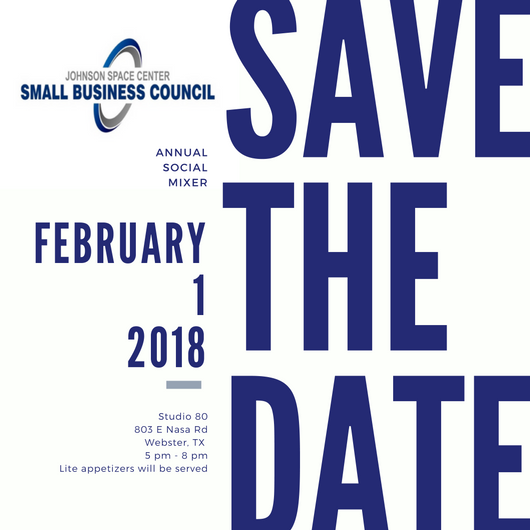 We have rescheduled the JSC Small Business Council Annual Mixer to Thursday, February 1st. The mixer provides a terrific opportunity to get to know JSC's small business community, including NASA and industry representatives! We look forward to seeing you on the 1st.